@Zhongzheng | Get Your Grub On! 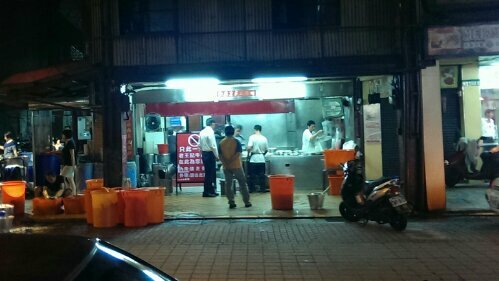 This was the shop I had my first ever Taiwanese beef noodles in – truly an eye opening experience as you might imagine – and it’s also one of the, let’s say older and original places, which easily can be mixed up with dodgy and sticky. No really, the place is clean, just has it’s shining days of glory behind it, what obviously doesn’t impact it’s popularity as it has always been pretty busy around here when I came by. They didn’t have small or big portions here, just one size, which I reckon came closer to the larger bowls I had. Sure enough I ordered the ‘Spicy Beef Noodles‘ or ‘Hong Shao’ (红烧牛肉麵) and for a change I actually got what I asked for. It wasn’t overly hot but I absolutely loved it, that much that I didn’t even care that the added chilli oil hyped up the calories even more than usual. 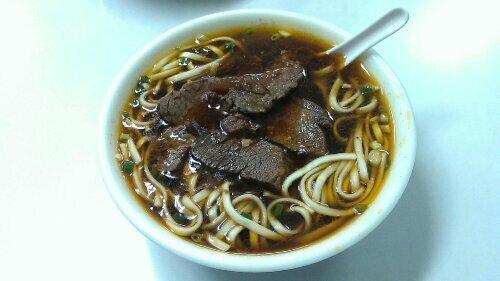 The noodles here were wicked, long and firm with a great taste to them, that, together with the loads of tender brisket bits made this my favourite bowl of beef noodles in Taipei to date. So good. Again no polished facade, not even a signboard but friendly enough people, absolutely outstanding simple food and for NT$150 a bowl a total steal as well. How fantastic that our corporate hotel is just down the road from here so I have the chance to come back even if the days at the office get longer.